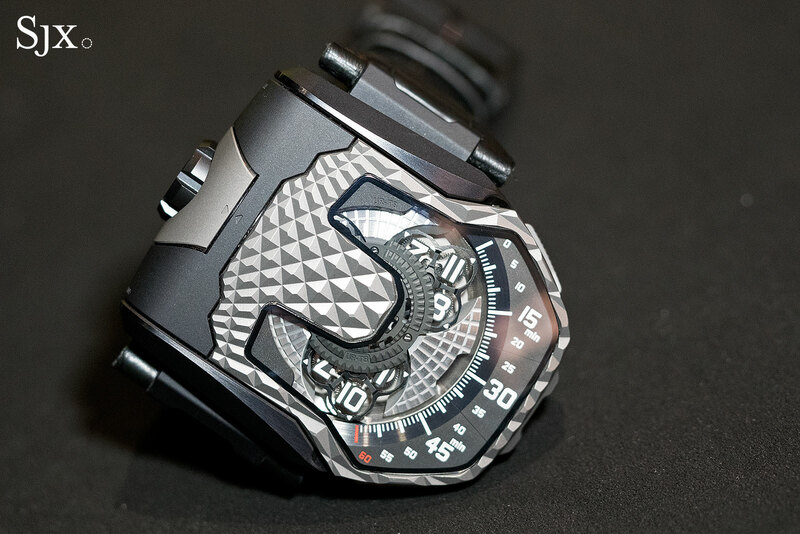 Urwerk has been making remarkably avant-garde watches for two decades now, but it did not produce a reversible watch, until SIHH 2017. That’s where the watchmaker took the covers off the UR-T8, a limited edition to mark its 20th anniversary. 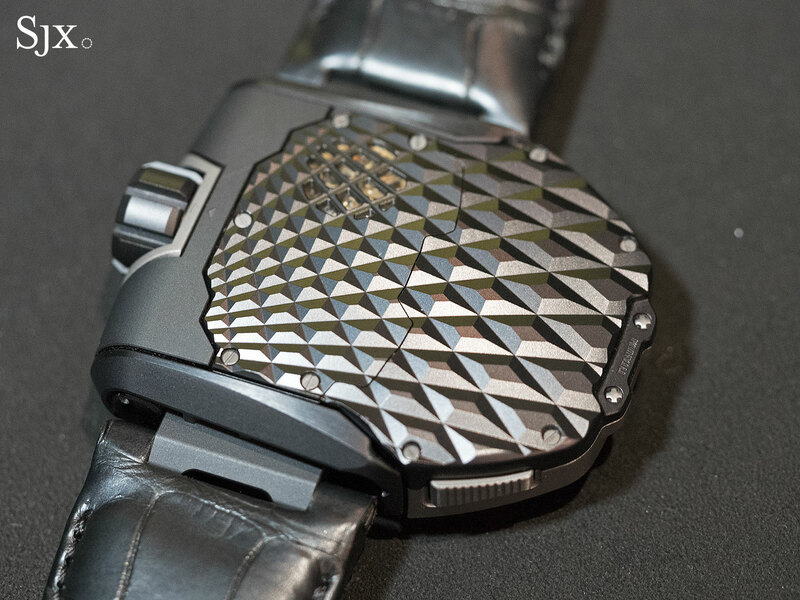 Made of titanium, the front and back plates of the case are covered in an engraved diamond motif that reminiscent of last year’s UR-105 T-Rex. The case is actually two parts: an inner case that’s nestled in a cradle. 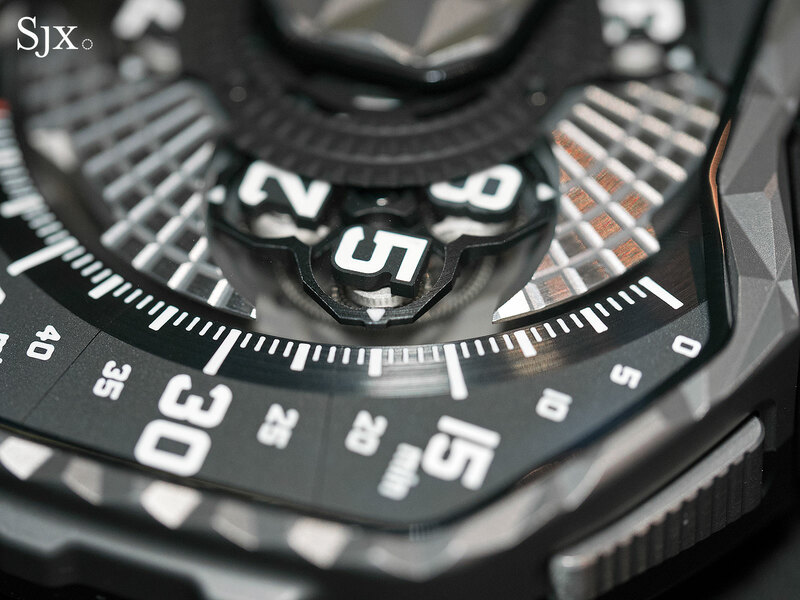 While relatively light, being made of titanium, the case is extremely large, measuring 60.23mm in diameter and 20.02mm thick, feeling almost unnecessarily massive. A pair of buttons on the edge of the inner case release it from the cradle, allowing it to lifts, swivel, and lock back down. Typical of Urwerk, the case is exceptionally precisely made, and like all Urwerk cases it is produced by Geneva case maker Chrisian Gros. It lifts and swivels silently, and closes back into position with a reassuring click. 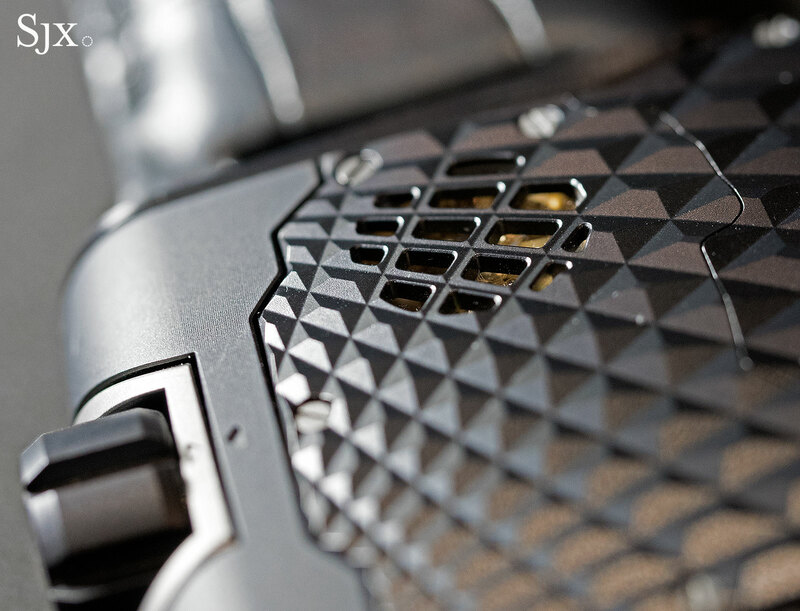 Additionally, the hinge is equipped with a security mechanism ensure that the case cannot be pushed back down if it is not correctly aligned with the carriage. While the reversible case is an example of exemplary machining, it lacks an explicit purpose because the rear of the case is empty. 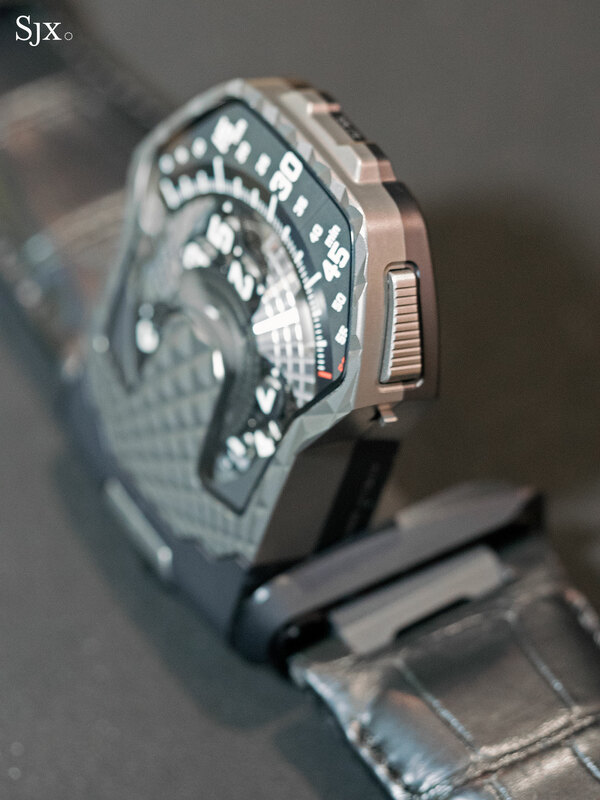 That’s somewhat ironic, since most of Urwerk’s watches are double-faced – telling the time on the front and featuring secondary functions on the back, like a power reserve indicator or automatic winding selector. 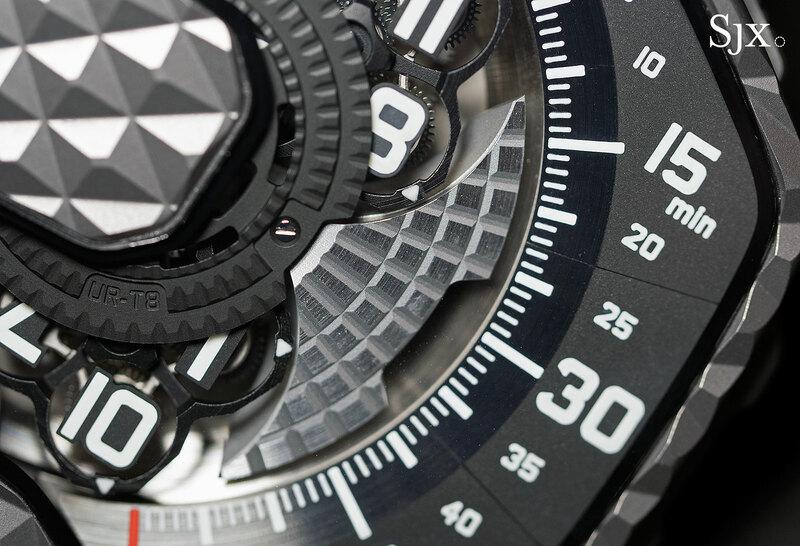 On the front, time is indicated via a wandering hours display that’s the Urwerk trademark, but the mechanism is the most elaborate execution of the idea yet. 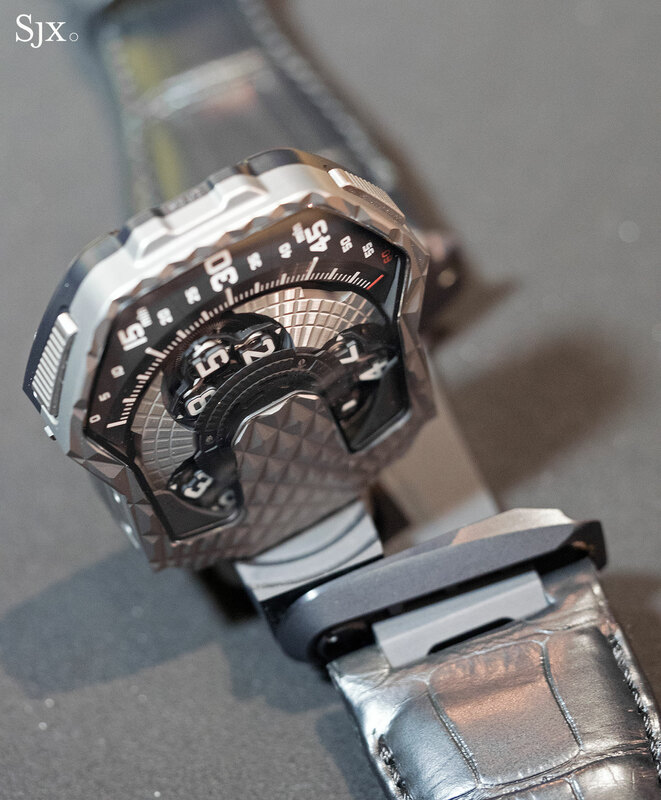 Instead of being a four-armed carousel that Urwerk used in the past, it has three arms, with four hour numerals on each arm. Each numeral is suspending inside a frame, driven by planetary gears below. 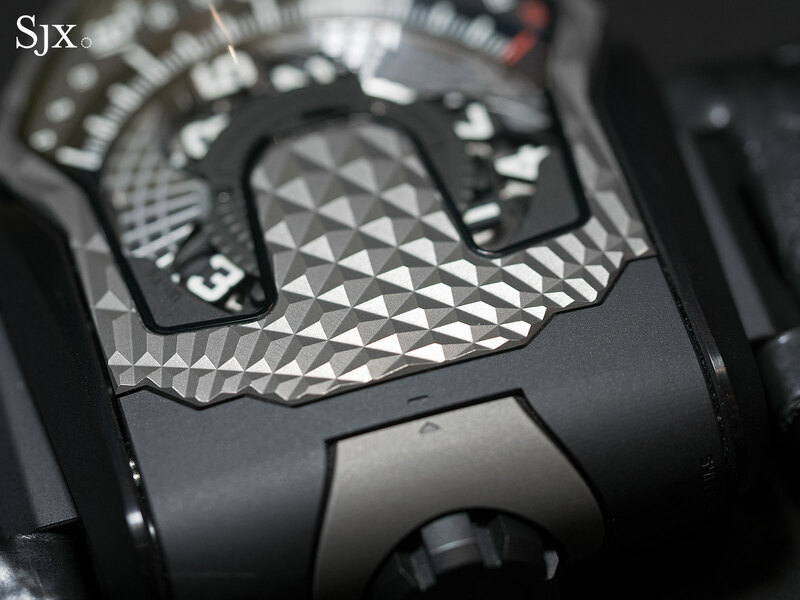 But more importantly, it’s improvement over the typical wandering hour display Urwerk uses on watches like the UR-105. Instead of tracking the alignment of the minute hand, each hour numeral sits horizontal – parallel with the diameter of the watch – as its travels down the minute track on the right. 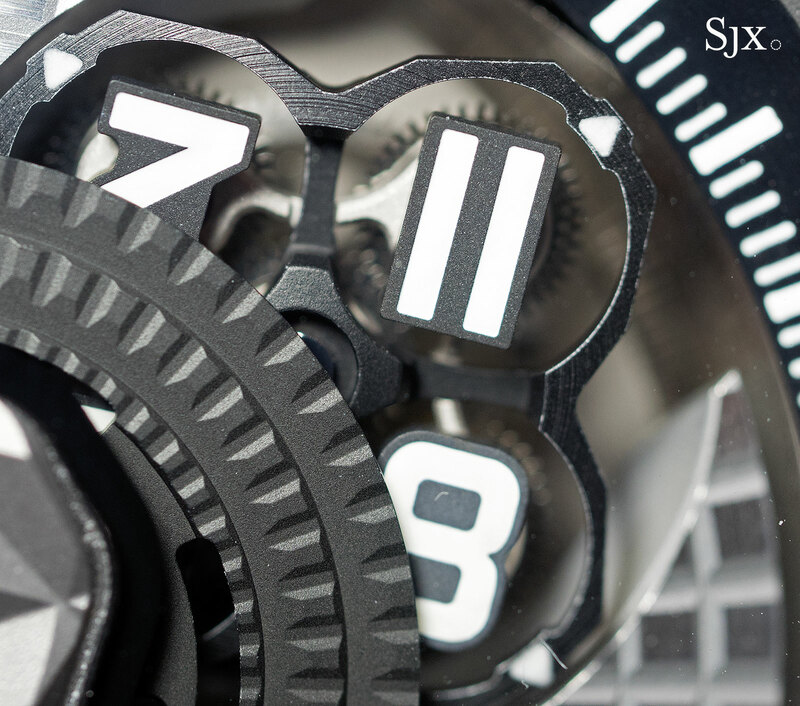 The movement is automatic with a tiny wind vane attached to the winding mechanism to regulate the speed of winding. An aperture on the back of the case reveals the motion of the vane. 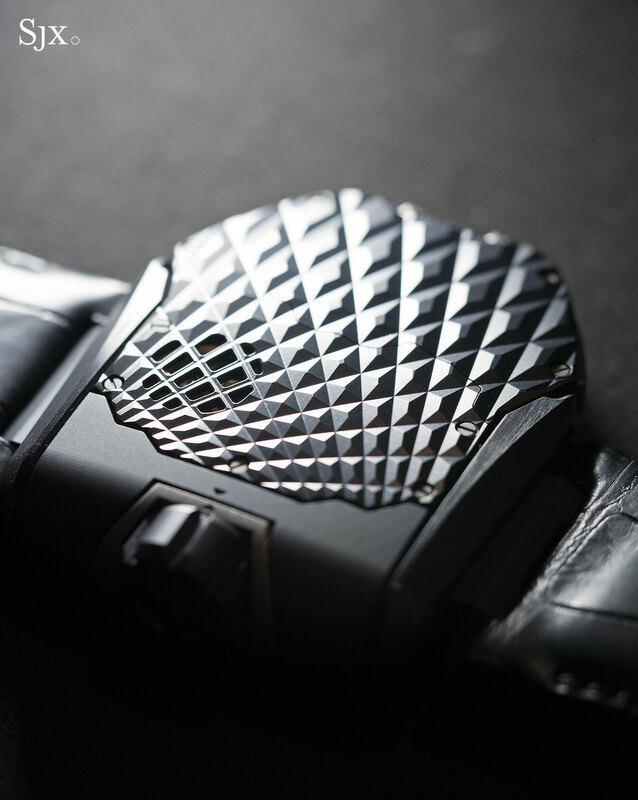 The Urwerk UR-T8 is a limited edition of 60 watches, available either in natural finish titanium or black coated titanium (the two-tone finish on each side on the watch pictured is only for the prototype). It is priced at SFr100,000 (about US$99,100) and will be available starting April 2017.